Trump Reacts to Strzok Firing: Finally! 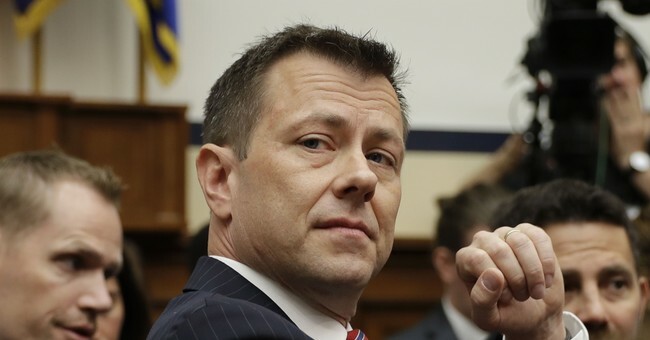 Embattled FBI Agent Peter Strzok has been fired from the Bureau after the Department of Justice Inspector General exposed blatant and rampant anti-Trump bias in his messages to a colleague. That colleague was former FBI lawyer Lisa Page, who was also his mistress. They exchanged messages about stopping Donald Trump from winning the White House. President Trump reacted to the news Monday morning on Twitter. A DOJ Inspector General report released in June detailed Strzok's bias and indicated he was incapable of conducting his work fairly as a result. During the course of the review, the OIG discovered text messages and instant messages between some FBI employees on the investigative team, conducted using FBI mobile devices and computers, that expressed statements of hostility toward then candidate Donald Trump and statements of support for then candidate Clinton. Strzok testified on Capitol Hill in July and said his opposition to Trump's candidacy came from a place of "deep patriotism."